Haryana Urban Development Authority has come up with a new housing scheme for the allotment of flats in HUDA Ashiana Scheme 2016 in Gurgaon and Rewari for the allotment of 1496 flats. The registration for these scheme will start from 28 September 2016 and the last date of application submission is 27 October 2016. Flats in the scheme are located in Sector-47 Gurgaon and Sector-18 Rewari. Under the scheme, two size of flats are available for allotment having a size of 34.30 square meter and 30.60 square meter. The cost of flats starts at the price of Rs. 3,76,293/- which goes upto Rs. 3,90,593/-. 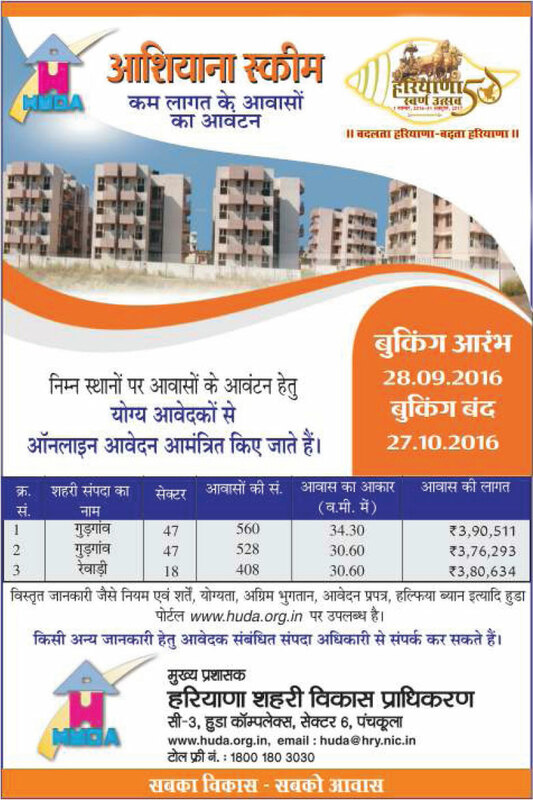 Applications for flats in HUDA Ashiana scheme in Gurgaon and Rewari will only be available through online for a limited registration period. Complete information of Ashiana Scheem 2016 such as how to apply, online application, registration process, scheme brochure, scheme advertisement and payment procedure will be available on the official website of HUDA at www.huda.gov.in on 28 September 2016.